WHAT: Our most popular ride, lasting about 90 minutes. WHERE: Depart East Ely, NV and ride up toward the Ruth Mine. Travel through two tunnels and up real mountain grades. WHEN: Steam every weekend mid-April through mid-October. Diesel other times. Check schedule below. DONT MISS: Complementary tour of the original shops and grounds with your train ride. WHAT: In addition to the regular 90 minute excursions, check out our evening and special / theme trains. MORE INFORMATION: These special trains are also listed on the calendar below. Join us for a trip back in time when the iron horse ruled the rails. 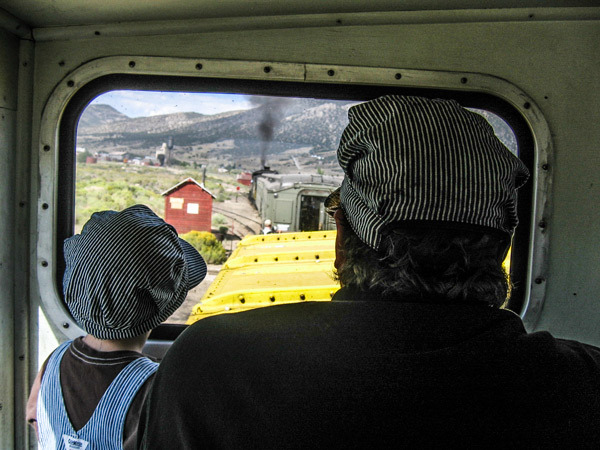 The Nevada Northern Railway is a living, breathing, operating historic railroad. 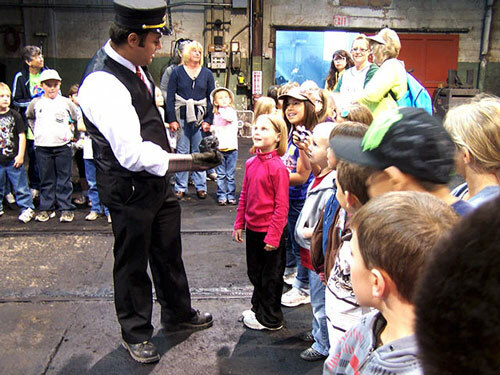 Historic steam engines are still in use here year 'round, so come, enjoy history with us! 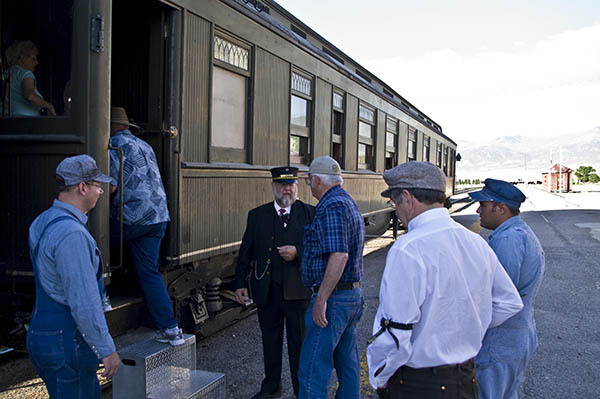 You will depart from our East Ely, NV depot, as all of our passenger trains have done now for a over a century. Most all of our trips head southwest, through two tunnels and up real mountain grades through Robinson Canyon up toward the Ruth Copper Mining District. Several trains each month, those specifically marked Valley Vista, run north, out the Steptoe Valley, on the hi-line toward McGill. Each trip takes about 90 minutes. Our trains feature on-board restroom, wheelchair accessibility, and snacks and beverages available for purchase. You will have your choice of coach or open-air seating, or feel free to roam between the two. A hat and sunscreen are advisable for the open-air car. Bring a jacket along for the evening trips. We are over a mile high in elevation, so weather is generally mild, but sometimes unpredictable. Every so often out in these parts of the West, trains get held up by a band of outlaws. We have done our darndest to try and figure out when this might happen, and have indicated it in the schedule below. If you see the word "ROBBERY" on the title of an event you hover over, then this is one of those trains that just might get held up. Some of the robbers have an uncanny resemblance to outstanding citizens of the community here, so don't be too alarmed. Those GhostRiders, as they call themselves, are volunteers that do lots of good 'round these here parts. Complementary walking "Back Stage" tour: At the end of most morning/early afternoon trips or 2 hours before most late afternoon trips you can a walking tour of the enginehouse and Main Yard. It is a great way to see how a real short-line American railroad maintained itself in the mid-1900's. Sturdy shoes are suggested for the tour. Ride in the Caboose: You and your party can ride in the caboose rather than the regular coaches. These option often sell-out in advance, and are not available on every trip, so we suggest you book them early using the calendar below, on this page. The extra fare for these options is a great way to show your support for the museum and the restoration/preservation work that goes on here. Of course, members earn their discount on these options as well. Can't Get Enough Trains? We completely understand. You can buy a Four-Day Pass upgrade and Save. Add the Four-Day pass upgrade option when you check out. It is good on any of the Regular Excursion Trains. 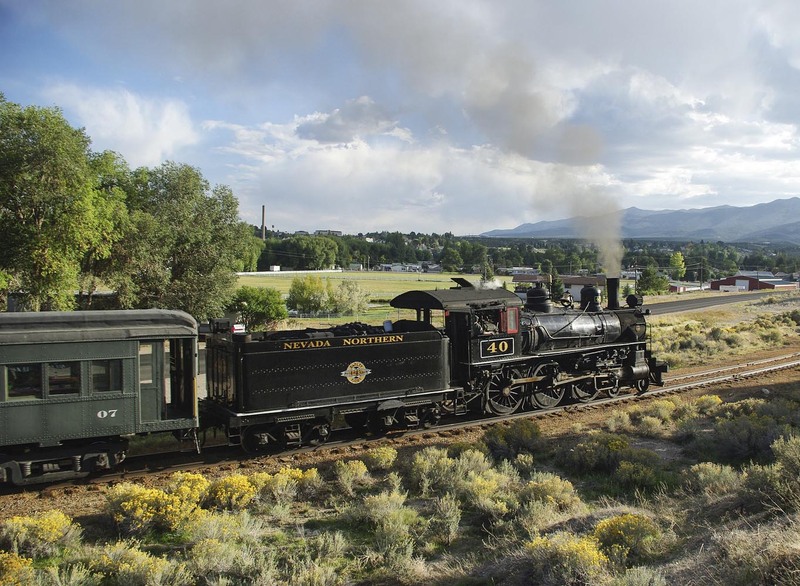 NOTE: If you want to book one of the Special / Theme / Holiday trains, book that train first, then add the Four-Day pass so you can also ride the Regular Excursion Trains. The Four-Day pass is only valid for use on the regular excursion trains, and not on the Special / Theme / Holiday trains. Members receive 10% to 90% discount on train tickets depending on their membership level. Membership discounts are applied automatically on-line when you log in to your member account. Memberships start at only $30. 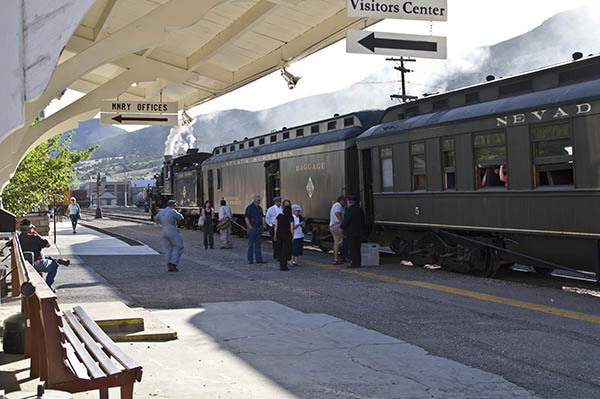 White Pine County Residents who are not members can sign up for a White Pine Pass for free that entitles you to 10% off regular excursion train tickets. Sign-up in person for free at the ticket window. Just bring your drivers license to prove residency. Once you have your card the discount is applied automatically when you log in to your account. Mothers ride free on Mother's Day, Fathers ride free on Father's Day, Veterans and active service military ride free on Memorial Day. Buy tickets for the rest of your party on-line, then show up at the ticket window for the free ticket. Active Service Military and U.S. Military Veterans receive a 10% discount on excursion trains. Use promo code "military". Tickets will automatically be set to will-call. Bring your military ID to the ticket window for verification to claim your tickets. 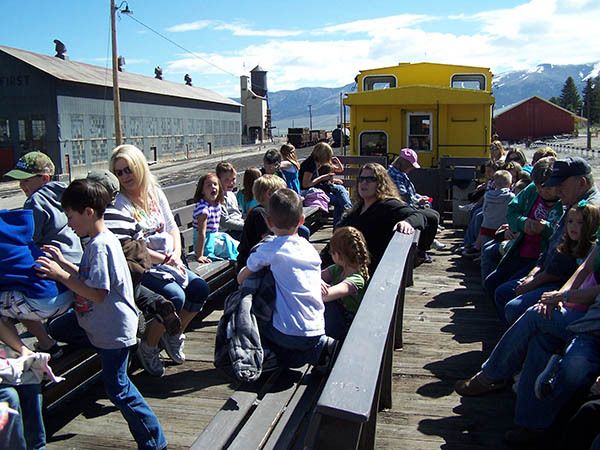 Kids Ride Free Monday thru Thursday on our regular Summer excursion trains. This includes almost every mid-week train in the Summer, but excludes holiday, charter, and special trains. 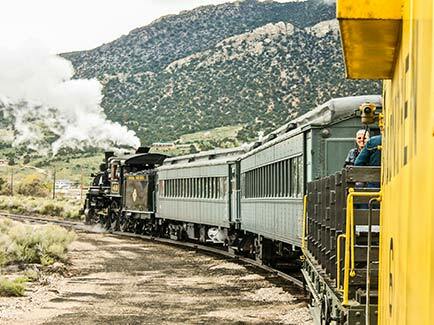 AAA and AARP Members receive a 10% discount on the regular excursion trains (but not on special themed trains). Use promo code "AAA or AARP". You will need to bring your current AAA or AARP card to the ticket window for verification, and to claim your tickets. Membership or White Pine Pass discounts are in addition to the single best discount above. We will automatically calculate the highest discount you are entitled to for each ticket. All discounts are verified at the ticket window when you pick up your tickets. Groups of 12 or more should call (775) 289-2085 to arrange their group visit at a discount. Hover over any available date to book your Ride Back in Time now.